The Rickey is D.C.‘s native cocktail, invented in 1883 at Shoomaker’s by George A. Williamson and named after Colonel Joe Rickey. 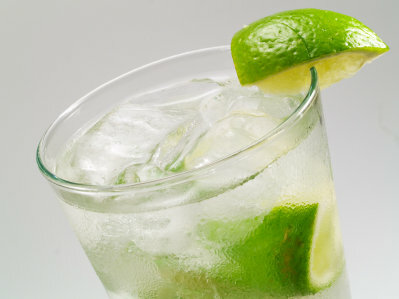 The drink consists of any base spirit with lime juice and sparkling mineral water or soda. 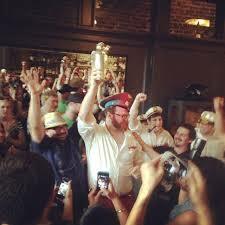 The original was made with bourbon and served in a goblet with ice and the lime shell dropped in the glass. It was not served with sugar. Mix spirit and lime over ice in highball or goblet. Top with soda water. For every quart of sweet potato juice, add the sweet potato pulp from the juicing. On the first day, add 4 ounces of sugar and a half ounce of ginger bug starter (the ginger bug is made with organic ginger, de-chlorinated water, and a tablespoon of demerara sugar. Once it starts bubbling, it gets fed fresh water and sugar as needed). Every day after, it gets fed an ounce of sugar per quart. We keep it in a warm place so it ferments dry pretty quickly. The best way to keep the bad bugs away is to keep the good bugs fed, after the manner of a sourdough starter, hence the continuous fermentation. Start with the pulp from ginger juicing. For every eight ounces of pulp, add 2 ounces of sugar, 12 ounces of de-chlorinated water, and a barspoon of ginger bug. Once fermentation has begun, add a 1/2 ounce of sugar per day. The ginger bug contains the lactobacillus, so we keep mother in a warm place in the kitchen to encourage the production of lactic acid. After one week, the liquid can be racked off and kept in a separate container at room temperature. After racking, introduce ten granules or so of champagne yeast per pint. At this point, it should be fed a barspoon of sugar per day per pint of liquid. Bring 34 oz of filtered water to a boil, add 1.5 tsp of dried lemon verbena and .5 tsp of dried wormwood. Let steep for 7 minutes. Strain out herbs and add 32 oz sugar. Stir and store cold.